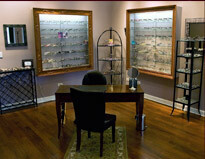 Getting a high-quality, high-end frame, shouldn’t mean you have to endure snooty service! We take care to maintain a relaxed environment. We are famous among our regular clients for our never-empty bowl of Hershey’s Kisses in our showroom, and our experienced staff. Whether you want casual or classic, funky or sophisticated…we can help you select the frames and optics that fit your needs, personality and lifestyle. We want you to be happy with the frames you choose, and for you to get the best value out of your purchase. That’s why we also offer a one-year manufacturer’s warranty against defects, and are happy to make minor adjustments to your frames at no cost if they lose their perfect fit over time. Click here for our location and hours to find a convenient time to stop in and see our collection for yourself. Our selection is always changing, so even if you are not in the market for frames, stop in, say hello and ask us what’s new. And if it’s been a while since you had a complete examination, click here to schedule and appointment. someone else when you upgrade your own frames.